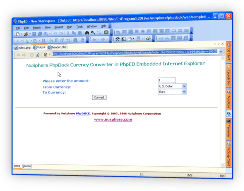 View the output generated by PHP scripts, HTML or any other files inside of PhpED IDE using PhpED's embedded web browser. 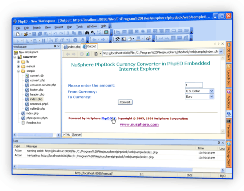 View the output generated by PHP scripts, HTML or any other files in any of the installed external browsers, such as Internet Explorer and Mozilla. 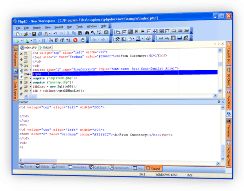 View the HTML code produced by the PHP scripts as it is produced in debugging session. Go to Tools->Default Browser and select one of the previously configured external browsers or embedded browser. Alternatively, you can go to Tools->Settings and select IDE Settings under IDE section and select one of the previously configured external browsers from the drop down box next to Default Browser. For example, the illustration below shows selection of Mozilla Firefox as en external viewer. 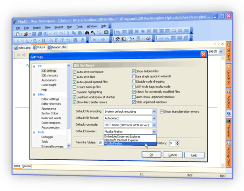 Select Add button to add another external or Delete to delete selected existing PHP Viewer. 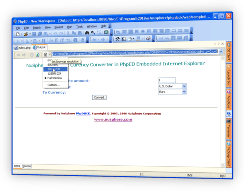 PhpED provides embeeded Internet Explorer and embedded Mozilla browsers. You can adjust the settings of the embedded php viewer following the instructions on embedded php viewer page. When you do this, PhpEd will execute the PHP files you selected and render the output in either Output tab, if the Default Browser is set to Embedded Internet Explorer as it is shown on the illustration below or in the selected External Browser. PhpDock is Nusphere unique Windows Deployment platform for PHP. PhpDock is an excellent example of very light weight, extremely simple to use PHP Viewer, deployment and demonstration tool. In this tutorial you learned about the PHP Viewers available in PhpEd, and about the simple and convenient ways to view the output of PHP scripts. You can get an additional information about PHP Viewers on NuSphere Forum. 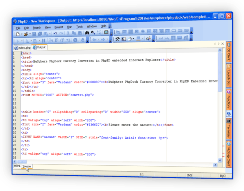 Download a free trial of our PHP IDE with the PHP Viewer today!